9/9/2009Share this story on Facebook! 1. Be prepared. Just about everyone who studies abroad suffers from culture shock to varying degrees, so don’t think you’ll be immune. And like many diseases and addictions, admitting you have a problem is the first step toward recovery. 2. Talk about it. Tell as many people as you can about what’s happening and how you’re feeling. Usually people find it helpful to talk about issues they are having. 3. Don’t forget friends and family back home. Technology is amazingly helpful these days for keeping contact: Skype is essential for free (or inexpensive) calls home or for video chatting; instant messaging and e-mails keep you in touch easily; and blogging can update those people who are difficult to contact because of time differences and busy schedules. 4. Manage your expectations. Some students dream of totally assimilating into their host culture; others just want to be American in a different setting. It’s often the ones in the middle of the spectrum -- the ones who recognize they’re just visiting but are attentive, polite guests -- who have the most positive study abroad experiences. 5. Do seek out English-speaking comrades to commiserate with. It shouldn’t be too difficult, as most programs you’d be in are with other American students. 6. But don’t rely on your English-speaking buddies exclusively. Remember that part of why you’re there is to learn about another culture, which often means learning and perfecting another language! 7. Try a homestay ... It can be a really amazing experience, but keep in mind that you’re living in someone else’s place and that you have different cultures. Spend time with your host. It gives you a better idea of the culture, and it lets you establish a sense of “house rules,” so to speak. Not to mention your host can be a great resource for things to do or see, how to get around, etc. 8. … but don’t be afraid of staying in an apartment. You’ll see less of the daily life of a native, but you will get to have a space that allows you to follow your own lifestyle completely. If you choose this route, try harder to make some native friends. 9. Get involved in a regular activity. Whether it’s an old interest or hobby or something new, your program can usually help set you up. In Paris there was an international student choir and also a “young international people” group that had regular bilingual discussion groups, field trips, and so on. 10. Don’t stress too much about classes. What happens, happens. Do put forth effort, but remember to experience the city you are in. Of course you do! It's normal. But don't let nerves keep you from studying abroad. Learn more about all the study-abroad options at Ithaca and how we can help you have the best possible experience! I thought I’d fall eternally in love with the most romantic city in the world. But like all relationships, this one had its ups and downs. Here’s how to get over the inevitable culture shock when you study abroad. Two long flights last January and my life is completely different. I couldn’t believe I was finally in Paris. I jumped right into things, particularly the language. I thought my French was better than it was, so getting through orientation was tiring and frustrating -- everyone spoke a lot faster than I was used to, and it was hard to keep up. 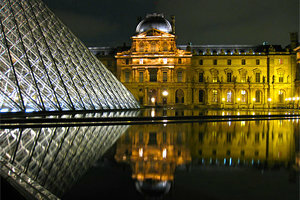 Here's a shot I took outside the Musée du Louvre. On day two, I went exploring the city with some classmates and saw the Eiffel Tower, Arc de Triomphe, and the Louvre. Then we got coffees in a bar and everything was just fantastic! We attempted speaking French to service people, but they could obviously tell we were novices; we didn’t care because we were just enjoying ourselves. Not everything was perfect: Errands, like trying to get a phone, took way more time than they should, and I was also nervous about navigating the Metro -- at first glance, 14 lines seems really confusing, but once you get used to it, it’s really easy. I became a pro pretty quickly. Being in Paris just felt like an extended vacation following winter break; we had no coursework for the first two weeks besides French class, so it felt like a free-for-all. 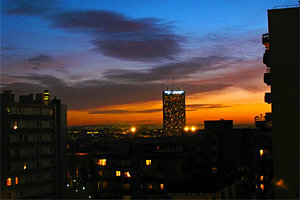 This was the view from my apartment at sunset. As the weeks passed, I grew more and more homesick, something I never expected of myself. I missed my friends and family. The cute cafés and tempting patisseries only reminded me how much I craved an iced coffee and a bagel from Dunkin Donuts. I grew tired of hearing and speaking French and yearned to have a conversation in English. I felt lost, confused, isolated, and depressed. After spending quite a bit of time wallowing in the misery and loneliness, I realized that I was pretty much experiencing a textbook definition of culture shock. I’d learned all about it during orientation but ignored it, thinking it would never happen to me. But it was clear that I’d gone through the honeymoon phase, when everything seems so exotic and amazing and new and exciting, and was now stuck in crisis phase. The question now was, how do I move on? Getting over crisis phase is like trying to get over a breakup, when you bounce back and forth between giving in to the depression and trying to make yourself move on. I alternated between self-isolation and seeking advice. I spoke to anyone I could about things that were bothering me, like my classes, instruction style, annoyances in my homestay, lingual irritations, etc. Classmates told me things to the effect of, “You’re in Paris, you should be happy!” which were as unhelpful as the advice from IES staff that I just had to adjust my life and my learning styles to the French ways. 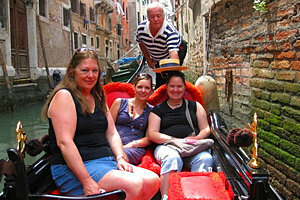 This is a photo of my mom, sister, and me in a gondola in Venice. Part of what made me snap out of it was recognizing I wasn’t alone in feeling this way. I thought about not only my classmates, but immigrants, who often know less English than I do French, and they’re in a foreign environment permanently. 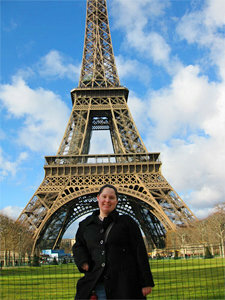 I also realized just how quickly the semester was passing and how little time I actually had left in Paris. I wanted to enjoy this experience, so I reminded myself that the classes weren’t forever and to just do my best. I had finally made friends and started doing more things for me and spending time outside. Spring had arrived, life was flourishing, and I didn’t want to let my time abroad pass me by. So many things felt weird to me when I got back -- like speaking English. I got so used to not being able to understand other people’s conversations that I felt uncomfortable overhearing people speaking English, as if I was eavesdropping. And cars, trucks, and food seemed so big! In France, it’s all Smart cars, scooters, and no pickup trucks; they certainly won’t ask you to supersize! After a brief return to the U.S., a month-long stay in Rome, and my eventual move back to Ithaca, I’ve transitioned into my American ways of doing things. Of course, I do still miss certain cultural things I picked up in France (like good espresso, public transportation, and not having to tip at restaurants). Despite the emotional roller coaster, I would definitely recommend studying abroad. No classroom experience can compare to what you’ll learn from seeing everything through your own eyes and living in a completely different environment. You’ll test yourself in ways you never could have imagined, while having adventures that you’ll remember for the rest of your life!